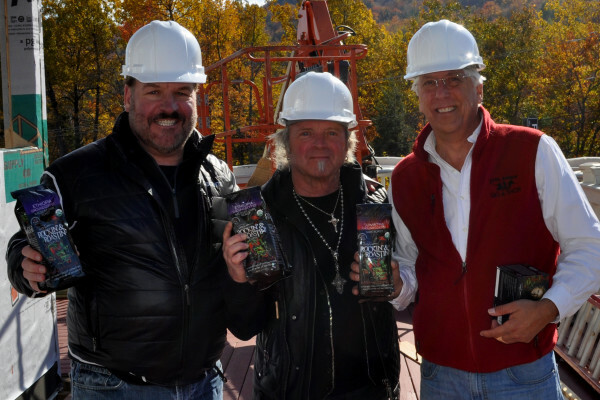 Frank Cimler, president of Rockin' and Roastin', founder Joey Kramer drummer of Aerosmith and Les Otten, former owner and developer of Sunday River Resort, break ground on a new cafe this fall. The newest dining option in Newry is run by Aerosmith's drummer Joey Kramer. His Rockin' and Roastin' Cafe and Restaurant opens this season at Sunday River. What drummer Joey Kramer doesn’t know about skiing, he is making up for with a double shot of enthusiasm. The drummer of rock band Aerosmith is opening a restaurant/cafe in Maine’s ski country this season. “I am very excited about this,” said Kramer of his first Rockin’ & Roastin’ Cafe & Restaurant in Newry with stunning views of the slopes of Sunday River. A coffee entrepreneur since 2012, Kramer and business partner Les Otten, former vice chairman of the Boston Red Sox, add some needed glam to ski country with the joint venture. Kramer plans to open a second cafe in North Attleboro, Massachusetts, soon and a third at Stratton Mountain in Vermont. Maine is his first foray into the restaurant world. Taking over The Phoenix, a popular apres ski headquarters, Kramer and Otten are extending the building’s prow front to the edge of the property with floor-to-ceiling windows to maximize the alpine vista. By early 2016 guests will be able to drink coffee, or something stronger, with unobstructed views of the trails and glades. The venue features a cafe by morning and live music and dining at night. It will be open year-round. “I want everyone to have good time and be happy,” said the rock star-turned-food entrepreneur. Baristas will prepare a variety of coffee drinks served with baked goods and sandwiches. Upstairs there will be full-service dining, though not too many culinary details have been shared. Kramer’s public relations company says it will be “classic American cuisine,” featuring steaks, seafood and other hearty fare. “It will be a fun place to come, with rock and roll memorabilia. A super upgraded version of a Hard Rock Cafe, newer and better with great service,” said Kramer. How did the Hall of Famer go from banging out ’70s arena rock to blending organic beans? While touring the world with Aerosmith, Kramer could never find a perfect cup of joe. Eventually he took matters into his own hands. Enter Rockin’ & Roastin,’ an organic line of the rocker’s favorite coffee regions — Guatemala, Ethiopia, Sumatra — blended with a fierce backbeat. The coffee is available in several restaurants, stores and cafes in nearby Bethel, so locals already know what to expect.